As we write this in early January, thanks to your generous help, KNOM’s finances are getting back in line. As you are helping us to dig out of red ink, and the darkness of deep winter abates, we thank you once again. May Our Almighty Father reward you abundantly. May 2007 be filled with His blessings for you and for everyone you love. INSPIRING WORDS: (left) If you could read the squiggles on the screen behind volunteer inspiration director Dave Dodman, they would say “kids need guidance and protection, but they also need appreciation and love. The words are in the voice of 10-year-old Rosa Schmidt, daughter of KNOMers Ric and Lynette. Dave’s sitting at the computer editing station where this, and most of KNOM’s educational and inspirational spots are assembled. 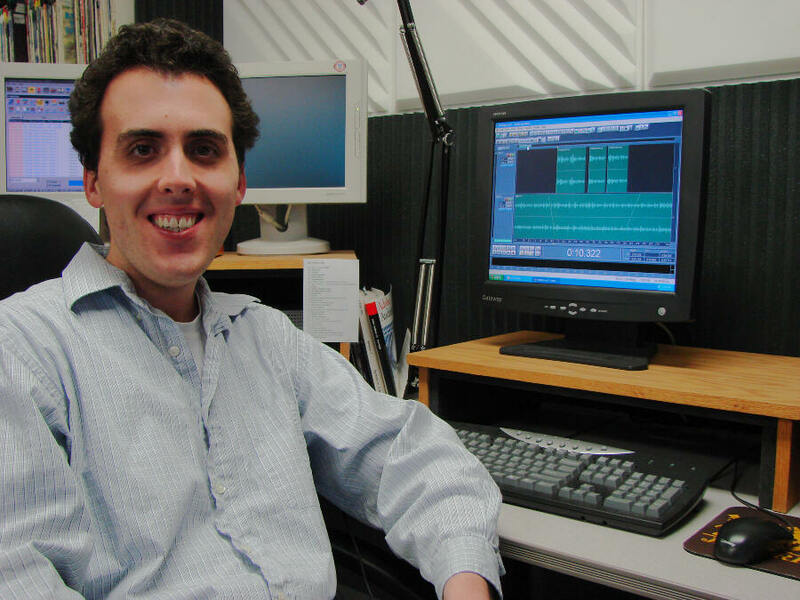 WHOM WE SERVE: The most recent western Alaska audience measurement survey indicates that, depending on the village, 76% to 100% of adults listen to KNOM every day. Isn’t that remarkable for a Catholic radio station? About 20,000 people, scattered across 100,000 square miles, hear us easily, and about another 10,000 pick us up, though with difficulty. GUARDED: KNOM reported that about a dozen soldiers of the Alaska Army National Guard are home from Iraq, now. Many dozens more remain in danger, and we know they would deeply appreciate your prayers. INSPIRATIONAL SPOT: Dear God, I do not know where You are leading me. I do not know what my next day, my next week, my next year will look like. As I try to keep my hands open, I trust that You will put Your hand in mine. “I’M NOT AN ENGINEER, but I play one at KNOM sometimes,” general manager Ric Schmidt says (left). Fortunately, the connections were simple to make, and Ric installed a new microwave link from the AM transmitter site, replacing a 16-year-old unit that had failed. The system sends meter readings, and, at times, alarms, to the studio. The unexpected $3,300 expense provided an extra ouch for the mission, which was quickly covered by a special friend. Ric, incidentally, hosted KNOM’s annual 7-hour Christmas greeting program, which included holiday wishes from about 400 callers. We estimate that about 10,000 listeners heard their names over the air. This year, we added a twist, and featured 33 audio greetings from Western Alaska soldiers serving in Kuwait, Afghanistan and Iraq. Another woman asked KNOM to wish her Middle-East-stationed husband happy birthday. She recorded our greeting off the air and sent him a tape, so he could hear the KNOM greeting. THANK YOU: We extend our heartfelt thanks to each of you who sent goodies to the KNOM staff for Christmas. One couple, making fresh wreaths for their children, made one for us, too! We’re accustomed to going without a lot of extras, and the treats helped raise our “cheer” level. Thank you! OUR HOURS: For our most recent fiscal year, the average cost of our broadcasts was $164.39 per hour. We think that’s good economy, in a place where costs are double those of the Lower 48. KNOM — strong, thanks to you, the oldest Catholic radio station in the United States. SOLDER BUT WISER: (left) On a monthly trip from Anchorage to Nome, financial officer Tom Busch prepares to install a small part into KNOM’s Emergency Alert System controller. According to an engineering chat group on the Internet, adding the part (a 4,700 microfarad capacitor) can help prevent the box from failing. 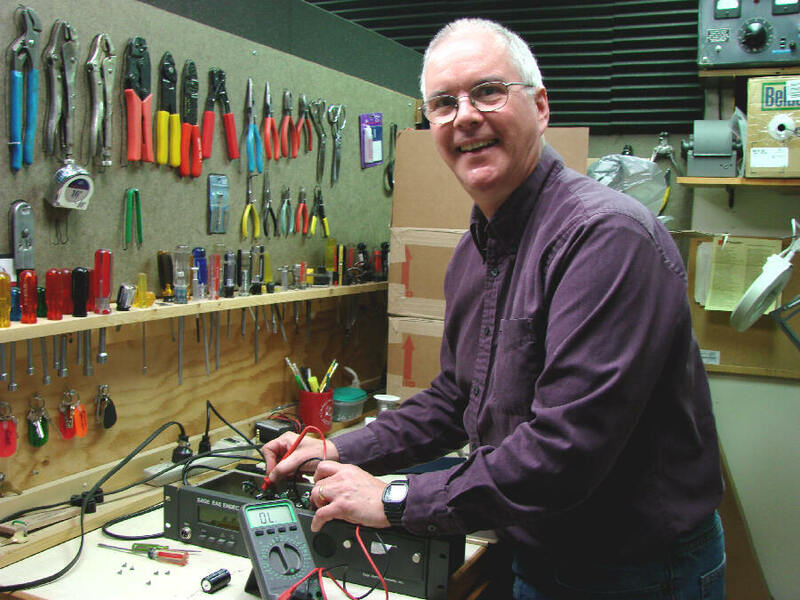 Originally a broadcast engineer, Tom managed the mission for thirty years, before stepping down into his present position, along with a bit of KNOM electronic fix-it work like this on the side. WE RESPECT YOUR PRIVACY: We continue our pledge to you, a pledge to which we have faithfully held since 1966, that we will not provide your name and address to anyone for any reason. COOL IT! Nome could be colder. In January 1989, we endured weeks of fifty below and lower. This year, it’s merely cool, in the low twenties below zero. Combine that with frequent fits of gusty winds, however, and the wind chills have been dropping to twenty degrees colder than that. It feels frigid, even to the old timers! WHAT A GAS: All of Nome’s gasoline is shipped in by ocean-going tankers when the sea is ice-free, and the winter’s price is locked up in October. Until next June, we’ll be paying $3.99 a gallon. Fuel oil, virtually the only source of home heating in this tree-less area, is a staggering $3.75. In villages, prices can be two or three dollars higher than that, a terrible burden to people who live below the poverty level, and are thus dependent upon gasoline for snowmobiles to hunt, in order to place food on the table. Ordinarily, folks travel from village to village to visit relatives during the holidays, but because of high gasoline prices, the wilderness trails were relatively quiet this year. Please consider adding our mission to your will. We prayerfully place all bequests into funds that provide only for major improvements or future emergencies. INSPIRATIONAL SPOT: God also helps those who cannot help themselves. DREAMS OF A “WOYTE” CHRISTMAS: (left) Home in Nome two days after Christmas, the Woyte family celebrate the baptism of baby Sophie. Office assistant Robyn is joined by her husband John, back home from Iraq, and Sophie’s older siblings Steve and Gracie. 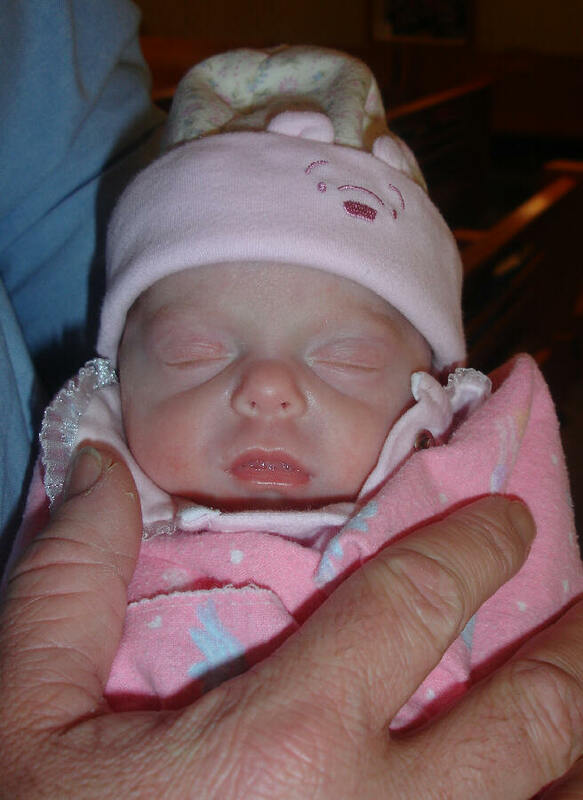 Sophie was born severely premature, but clung to life, and at Christmas, was above four pounds. The Woytes thank you sincerely for your prayers. 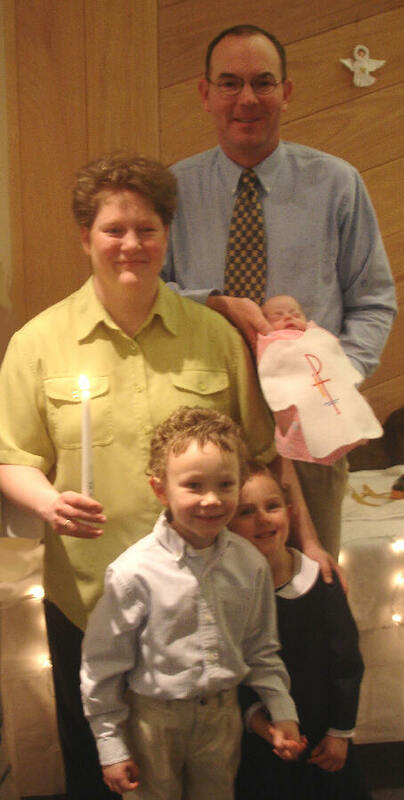 (Left) Still tiny, Sophie Woyte sleeps peacefully through her baptism. FORTY YEARS AGO: In Anchorage in January 1967, pioneer Alaska broadcaster A. G. “Augie” Hiebert begins to work on an F.C.C. license application for the proposed Nome Catholic radio station. WHAT ARE WE BATTLING? We’re battling a shortage of priests and Church workers. Most of the remote villages we serve see a priest only rarely. We’re battling many other things: Alcoholism, home violence, child sexual abuse, child suicide….The list sometimes seems endless, all of the ills which the people of this vast region suffer at rates higher than anywhere else in the United States. We are here to bring the Mass and Rosary into homes. We are here to foster discussion of solutions. We are here to inform, to educate, to inspire, to provide encouragement and positive companionship. Thank you for being an important part of this work! As we embark on the challenges of another year, we send you our gratitude for your support and prayers on our behalf, and again, we offer our prayers for you in return. Happy New Year!